The DIN-A1 ensures professional and successful advertising and makes your new beauty treatment known quickly and easily. The DIN A1 customer stopper ensures a professional and skilful brand appearance and makes your new beauty offer known quickly and easily. 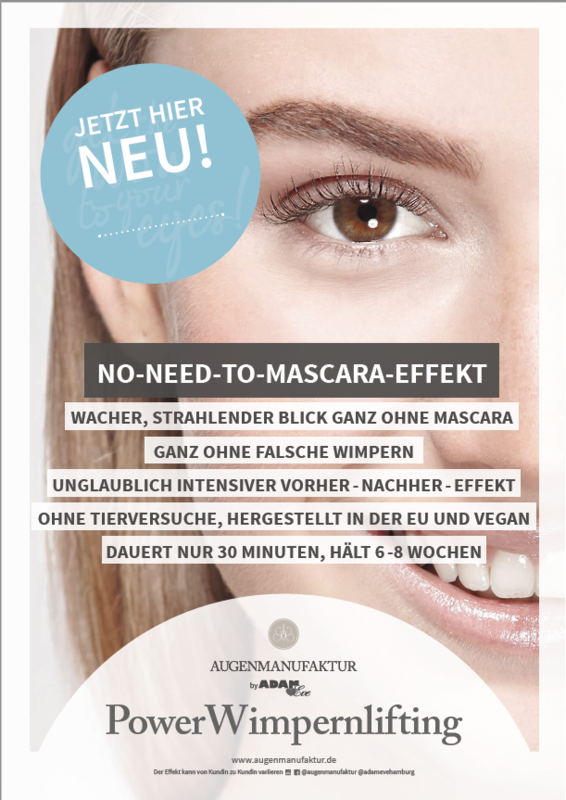 The Augenmanufaktur advertising material simplifies your own and time-consuming marketing work and thus saves you expensive production costs. You can use the advertising material individually for your advertising purposes - for example for the purpose of shop window advertising in your studio. Advertise the trendy eyelash lifting eyewear manufacturer, because your customers will love it! If you store the poster properly, the good quality of the product will be maintained for a long time and you have the possibility to use the advertising material for different actions and at different times. You can use the professional advertising material in your shop window or attach it to the wall in your studio. Check where your customers first look after they enter your shop. With this knowledge you can optimally place and advertise new beauty products and applications.